Heather and James are the definition of true loves. If you remember, we told you a little bit about their love story when we shared their engagement session with you guys! In high school, they dated for two years but decided to go their separate ways. James went to the military while Heather went off to college. Even though they weren’t dating anymore, they still kept in touch, and one night, 10 years later, they decided to meet up again. This time they were truly inseparable! After reuniting after a decade, they both realized that they had always been the one for each other. A year and a half later, James proposed in Thailand and Heather said yes! These two lovebirds found their way back to each other after 10 years of being apart, and are now MARRIED! Their wedding day was just as romantic as their love story. 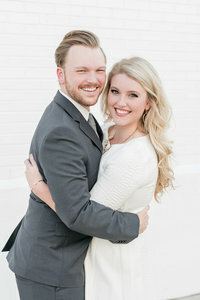 Everything from Heather’s Jimmy Choo shoes to the blush and white color scheme was to die for! Not to mention the gorgeous St. Paul’s Cathedral they were married in! In that beautiful cathedral, James got teary eyed as Heather walked down the aisle in her stunning Mori Lee wedding dress, which triggered the water works in everyone else! The love they share carried all the way over into their reception at The Florentine in downtown Birmingham where they had one of the sweetest first dances. Heather and James’s wedding day was definitely one to remember. Heather and James, we loved being a part of your wedding day. But more importantly we loved getting to know you as a couple. From our first meeting with you until your wedding day, we were thrilled to be working with you. You two are some of sweetest people we know and your love is undeniable and inspiring.